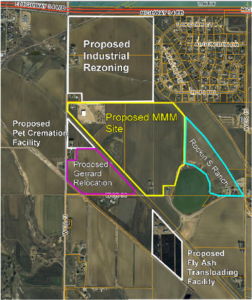 While CLR-34 NA was fighting Martin Marietta Materials’ proposed aggregate processing facility, the neighborhood was assaulted with additional proposals for industrial activities submitted for nearby parcels of land zoned Agricultural. These are summarized below. In July 2015, Weld 34 LLC, including Envirotech and McWhinney, applied for a Change of Zone from Agricultural to Industrial on two parcels adjacent to the MMM property on WCR13. The applicant was very vague about what they planned to do on this property, but they focused on the existence of rail and suggested that they planned some sort of transloading facility. 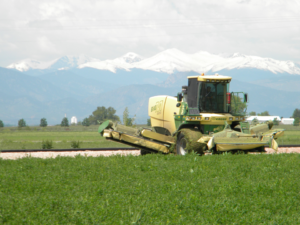 The Weld County Board of County Commissioners (BOCC) denied the application. W3 Legacy, LLC applied for a Use by Special Review on Agricultural land located on WCR56 near WCR13. The applicant proposed to use the property for parking heavy construction equipment, to construct a rail spur to receive flyash by rail, and to construct an office and shop along with a fuel station. The BOCC approved the application. In August 2015, Sage Brush LLC applied for a Use by Special Review on Agricultural land adjacent to the MMM property on WCR13. Sage Brush LLC planned to operate a pet crematorium and RV storage facility at the site. The BOCC approved the application.